Retinal detachment happens to approximately 1 person out of every 15,000. This disorder, which can occur at any age, is most common in myopic patients and those with a history of retinal detachment. The retina is a thin layer that covers the inner part of the back wall of the eye, where the images are focused that are sent to the brain. Under normal conditions the retina is attached to the most external layer, the pigment epithelium of the retina. Conceptually, a detached retina occurs when the neurosensory layer and the pigment epithelium layer of the retina separate. Rhegmatogenous: is the most common type of retinal detachment and is caused by a break in the retina that may appear after vitreous detachment. Tractional: usually associated with proliferative diabetic retinopathy. Exudative: usually associated with inflammatory or vascular pathologies or injury to the retina or choroids. The main symptom is usually repeated flashes of light in the same area of the visual field. This symptom would indicate a break in the retina, a condition that can end up as retinal detachment. Early detection of a break in the retina and its subsequent treatment using laser photocoagulation can prevent retinal detachment. Others symptoms may be partial or total loss of the visual field, perceived as a black curtain drawn over it. A thorough ophthalmological examination is required including a complete examination of the peripheral retina to diagnose all breaks in the retina responsible for the detachment. Optical coherence tomography and an ultrasound eye scan can sometimes be useful in making a diagnosis. Treatment is almost always surgical and consists of replacing the retina. 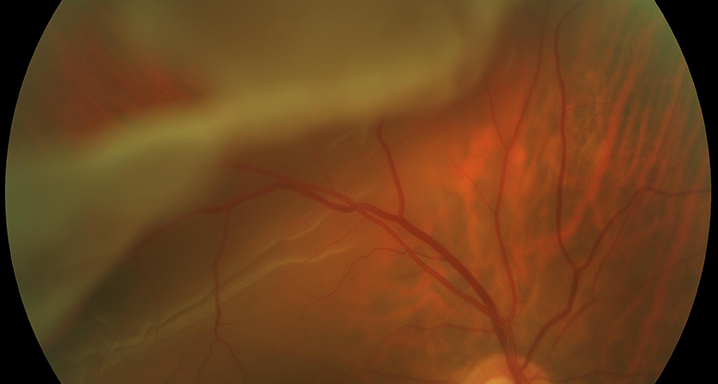 The aim is to adapt the retina and create adhesion between the neurosensory and pigment epithelium layers to seal the breaks in the retina using laser photocoagulation. There are various surgical techniques to treat rhegmatogenous retinal detachment and each case must be analysed individually to choose the right one. The speed and degree of visual recovery will depend on each particular case. The Institut de la Màcula has state of the art technology to treat retinal detachment. Choosing the best surgical technique for each case means that we can treat this pathology with the best guarantees of success.